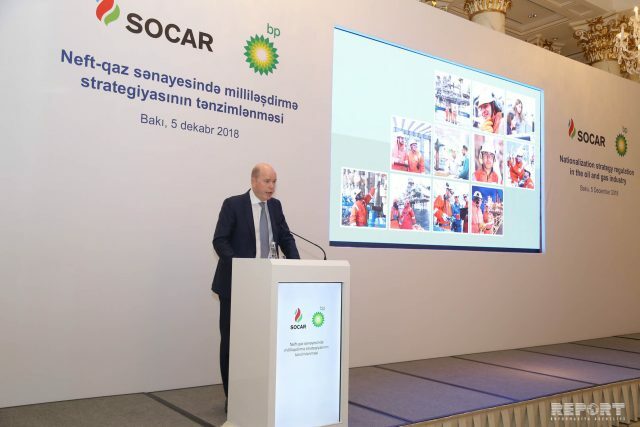 Trend:BP has managed to achieve significant results in the nationalization of Azerbaijan’s energy sector, Gary Jones, BP regional president for Azerbaijan, Georgia and Turkey, said at an event on the strategy of nationalizing the oil and gas industry Dec. 5, Trend reports. Jones noted that BP started its activities in Azerbaijan 26 years ago and the company is proud to be involved in all major energy projects in the country. For the five years of the program’s implementation, the number of Azerbaijanis working at BP reached 90 percent, which was BP’s goal, he said. He noted that the share of local personnel holding top positions in the company increased from 37 percent to 62 percent over the period. The number of women in high positions has doubled, he said, adding that the share of Azerbaijanis working in mid-level positions reached a record high of 95 percent. Jones also praised the Baku Higher Oil School, noting that it trains highly qualified specialists. He stressed that for economic development, it is important to create favorable conditions for a healthy competition. In this regard, he expressed gratitude to Azerbaijan’s state oil company SOCAR for cooperation. Speaking at the event, Head of the State Migration Service of Azerbaijan Vusal Huseynov also emphasized the high indicators of nationalization in oil and gas companies. He noted that the work carried out in this direction will make it possible to form a new labor market, ensure more effective participation of local specialists in transnational oil and gas companies and increase employment rates. In November 2013, SOCAR and BP signed a protocol on cooperation in nationalization, and in February 2014, SOCAR and the Ministry of Labor and Social Protection of the Population of Azerbaijan signed a corresponding memorandum of cooperation.